My newly adopted city was a mere 45 minutes by train from Amsterdam, which I convinced myself was nothing compared to my former daily commute by subway from East Flatbush, Brooklyn to lower Manhattan. I could get back and forth to Amsterdam with ease, even daily if I wanted. And I thought I might want to. I had friends, favorite restaurants, libraries, coffee shops, and seemingly places to be in Amsterdam. In order to tolerate life in this new city, I would surely have to make frequent trips back to the only city that mattered. And sure enough, after I made the move, I was making those frequent trips back to Amsterdam. I paid for a monthly train subscription that allowed for unlimited weekend rides, as the roundtrips were adding up at €11+ each. And to the best of my ability, I tried to keep in time with Amsterdam. I wouldn’t be one of those people who moved to The Hague, never to be seen or heard from again. But as time went by, I started skipping some weekends in Amsterdam. And I started paying attention to the neighborhoods I passed through as I got lost on my way to wherever. And wait, what’s this? 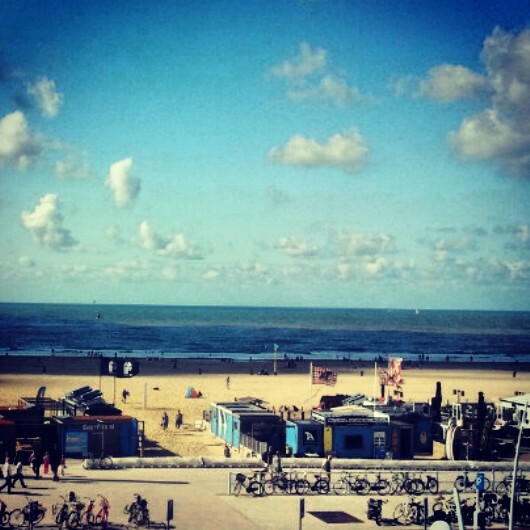 The Hague is super cute! And wait, who’s that? The Hague has Black people, too?! Veggie-friendly restaurants (a vegan restaurant on my corner), multiple libraries with free wifi, lovely parks, coffee shops, friendly neighbors with happy dogs. Even my neighborhood bike repair guy is from Ghana, yay (he fixed my tire for free). Turns out this underrated city has a lot to offer – much of it within walking distance. And then I finally went to the beach. A legitimate beach, just ten-minutes from home by bike. It’s a wrap – you have my heart! That beach looks really wonderful. It’s great that you were able to adjust and really liked it! Hey. Random question – I moved to Amsterdam a couple of months ago and I am a black woman. I have been searching for black community and social events in English but haven’t found any; what I see on the net is in Dutch. Would you have ideas and suggestions of where I can go to find black community in Amsterdam? Thanks.